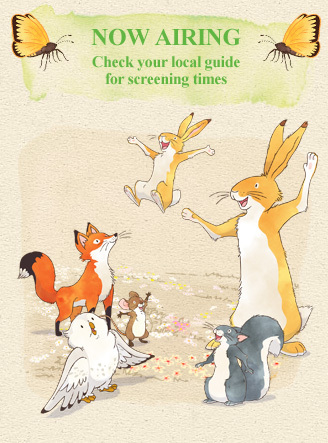 The animated television series Guess How Much I Love You – The Adventures of Little Nutbrown Hare is the first time adaptation of the best-selling picture book which has sold more than 30 million copies worldwide. For over 19 years, this memorable picture book about a father and son’s efforts to measure how much they love each other has charmed children and adults the world over. These enchanting animated tales explore the idyllic home of Little Nutbrown Hare, his father Big Nutbrown Hare and their friends with the same endearing simplicity and love that has made the book an international publishing phenomenon. Set in a watercolour world of grassy fields, mossy forests, lazy rivers and sunny green valleys, this gentle series is a timeless classic for a new generation. Guess How Much I Love You™ is written by Sam McBratney, illustrated by Anita Jeram and published globally by Candlewick Press/Walker Books. Guess How Much I Love You – The Adventures of Little Nutbrown Hare is co produced with Scrawl Studios and German broadcaster, KI.KA and ARD’s HR (HessischerRundfunk). ©2012 SLR Productions Pty Ltd.